In December we were sent some wonderful clothes from F&F to test out and review. They came at the most perfect time as Max was needing some smart shoes and a nice shirt for the festive season. Now it is over it's time for the review! How we really got on with these gorgeous pieces of clothing. 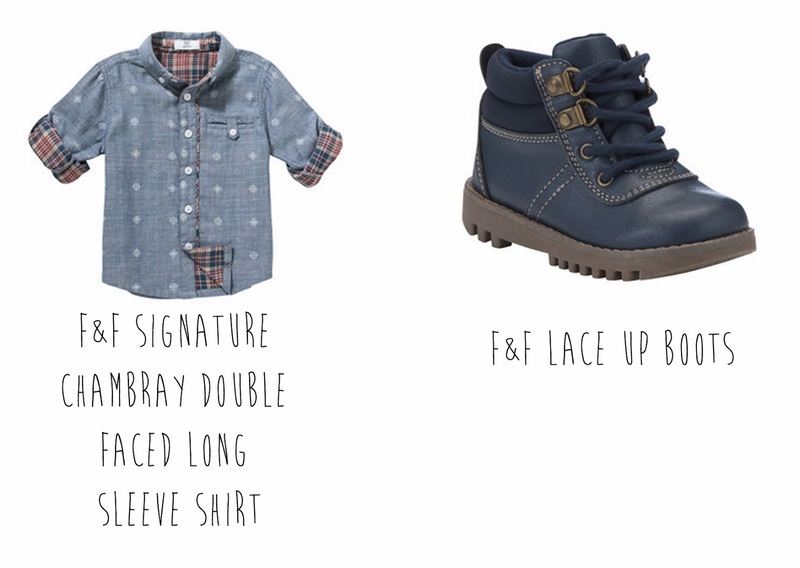 We picked the gorgeous Signature Chambray Shirt and the Lace Up Boots. Both of them were reasonably priced and great fits. I've never really bought clothes from Tesco before but was really surprised at the awesome selection on their site. Both of them we have been wearing loads this holiday season for as many occasions as possible. First up the shirt. Honestly this shirt is super soft and ridiculously cute! I honestly never would have paired chambray, plaid and white detailed print but it seriously works. We've teamed it with everything from bright jeans (see below) to under a smart jumper. He even wore it to see the big man himself - Santa! The best thing about this shirt is that it seems to fit with everything. He wore it to his preschool Christmas party and any food stain washed right out just in time for a night out at the theatre. One thing I wasn't too keen on was the sleeves. They're quite tight when rolled up but in all honesty that may just be that Max's arms are still a bit chubby! Having got a lot of use out of this shirt we can safely say that it was perfect for the holiday season and honestly we can dress it up or down for any occasions. It's a firm favourite in our wardrobe now! Next up is the boots. Let's just say these boots are one of the best pairs of shoes Max has ever had! The faux leather makes the shoes so soft yet robust to wear. They're splash resistant so they have been fine when the weather turns sour. They haven't even scuffed or marked in the time we have had them. They seem to go with every item of Max's clothes which is amazing as he has some really strange clothes in his wardrobe. Like the shirt, they seem to work when dressed up or down so for any occasion it works. We've even tried these at preschool where it can get really muddy and they have wiped down perfectly. The one thing that does annoy me is that the laces are quite long. They are always double knotted and they still get stood on slightly. I know this can be fixed by chopping them or swapping for some smaller but other than that these boots are perfect. Well who would have thought that a supermarket can make some amazing quality clothing. I seriously underestimated you F&F. So much so that a week after receiving the clothes we bought him the gorgeous quilted jacket too! How adorable does Max look? Love those little boots at the top of the page and the first picture of Max, I see a future of modelling.